Unusual chocolate brown and creamy tan colored Zebra Jasper tumble stones. Zebra Jasper tumble stones are visually interesting with their multicolored markings and patterns that resemble the striped hide of the indigenous species of Zebra from Africa. 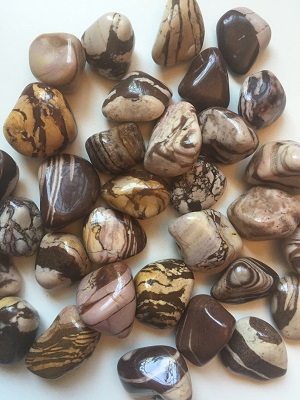 Just like the stripes of their hide, which are unique to each Zebra, Zebra Jasper energetically supports individualism, self-expression, and generates the courage to explore beyond perceived limitations and experience JOY in all your accomplishments. Much like the animal it is named for, Zebra Jasper fosters compassion and understanding of others, relationships, and situations. Zebra jasper is a stone for the greatest good of self and the community. Zebra Jasper helps one to look beyond superficial attributes and recognize connection and the loving spirit which may be found in all beings. Zebras are social animals and typically gather and live as members of small harems, or family groupings, which are part of a larger herd. Zebras often form mixed herds with other animals such as gazelles, wildebeests, and giraffes. This symbiotic grouping of animals offers greater protection in numbers from predators and utilizes the Zebras’ acute senses and verbal whinnying as an early warning indicator of trouble. Zebras have adapted and live in a variety of environments, such as grassy savannas, thorny bushland, mountains, hilly regions, and coastal areas. 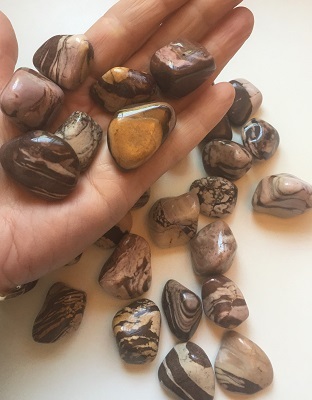 Zebra Jasper is a protective stone, facilitating connection with Earth’s energy, a sense of belonging, and encourages ecological awareness. Zebras are constantly on the move to find resources such as fresh grass and water. With it soothing vibrations, Zebra Jasper is known as a nurturing crystal that is energetically supportive over the long haul, balancing and grounding on all levels. Zebra Jasper lends support to follow through accomplishing goals with persistence and determination. Zebra Jasper helps one face challenges and perceived problems with integrity and courage. The patterning on Zebra Jasper creates a vibrational synergy making this crystal a powerful source for energetic grounding and connection while supporting physical vitality and endurance. 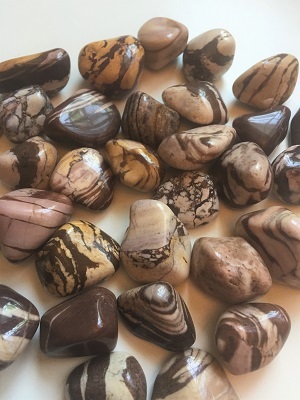 In healing, Zebra Jasper may be helpful in preventing or alleviating insect bites, as a coolant, and supportive for eyesight, hearing, and the sense of smell. 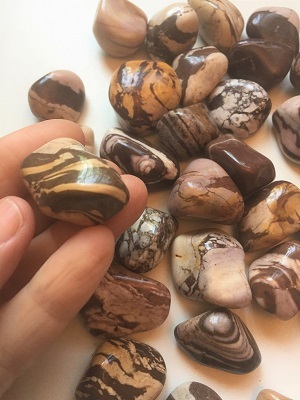 Zebra Jasper may also be supportive for the immune system, clearing pollutants and toxins from the body, stimulating and cleansing to organs, and for skin conditions.